After blogging every day for a month I suddenly had trouble thinking about what to say, so I didn't say anything. But now that I have a finish I thought I could talk about that. My friend *Kio and I are very creative and usually when we spend some time together we start some crazy adventure together with more or less success. This week our adventure resulted in a spur of creativeness and we made a pattern. We are in the middle of making it up and finishing it and making a real pattern and maybe later we can show it to you. When we do it will be found over at our new adventure-land. 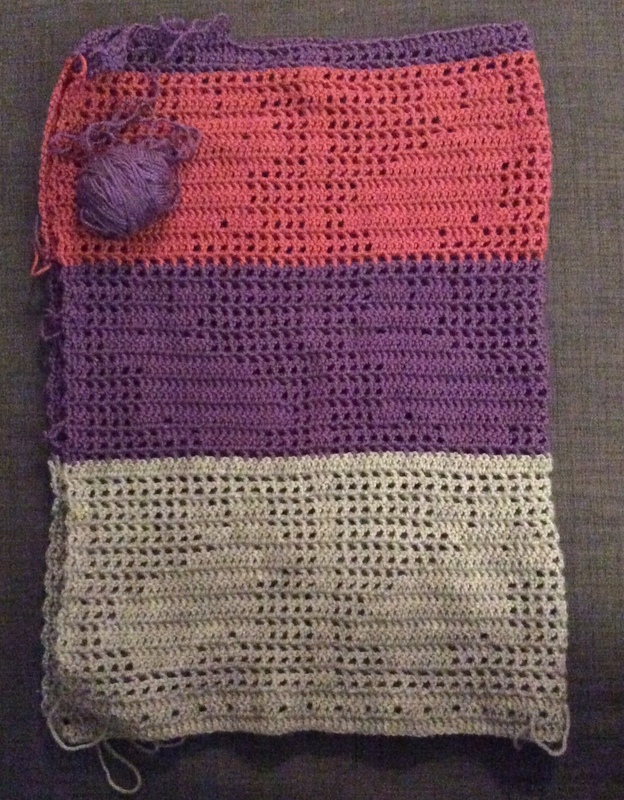 This is my finish, all 28 grams of yarn and I do say I like it. Do you? if you would like to make one stay tuned to this space. 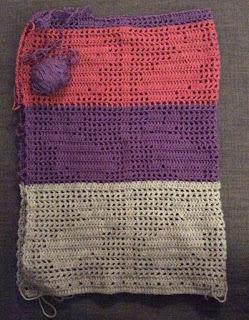 In all this creative-ness I have gotten a bit further on some of my more long-term projects, I finished the purple and pink and started on the second purple on the baby bunny blanket. When this baby is done I am hoping that all that Novita Acrylics will be gone. I have found that although acrylics are soft and pretty they are not my preferred yarn so I doubt I will re-stock my acrylics stash anytime soon. But it is good to have another baby-gift ready in case anyone have a kid or two. Mimle as usual is busy eating. Today we had craftsmen over who worked a little on our porch, they smiled at the buns whilst the buns were a bit shy and hid from the workers and their loud noices and fresh air. 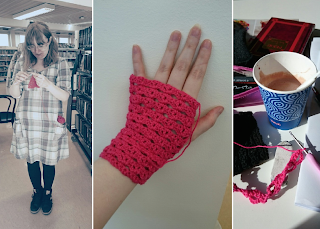 This week we have been busy de-cluttering our house and Mister M's childhood things, I have been swimming with *Kio and our muscles were not as sore as last time and I spent a day at the library picking out books for this month and sketching my pattern. So very busy indeed, but a very fulfilling week, I hope you will continue with our adventure. Don't forget my giveaway on Sunday. The chances of you winning are quite high at the moment. All you have to do is to comment on that post. And on Monday I am going out shopping so something more might be added to each prize.